The Philips Company has distinguished itself in producing user friendly and hi-tech appliances to help every household in their daily activities, the products are also affordable. One of their great products is the GC4410 steam iron box; it’s most effective when used on cotton. It has a maximum of 2400 watts and has lime scale prevention in its 350 ml water tank. The sole plate is aluminium coated ensuring the correct press for your clothes with the correct temperature. It has a feature for regulating temperature for different types of cloth. The GC4410 iron box comes with a spray to moisten your cloths for better results. It glides almost effortlessly over your clothes ensuring wrinkle free and safe ironing. It also incorporates a steam tip and a 360 degree swivel to help you reach most of your clothes. Although it’s relatively light in weight it’s not a good travel iron box. The GC4410 iron box ensures fast, convenient and powerful ironing; this is because of its light weight and user friendly design to minimize any form of strain when in use. It also requires relatively low power of about 220-240 v, 50/60 Hz frequency and consumes about 2400 watts of power when being used. It also allows you to use tap water for steam and ensures no spots when ironing since it has a drip stop facility and a double active calc system to flush out any particles. Its cord binder ensures easier storage for the power cord. 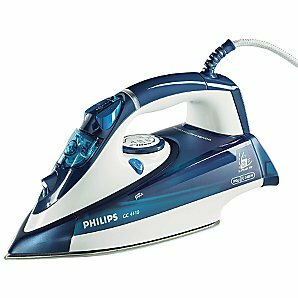 This makes the Philips GC4410 iron box appropriate for use by any member of your household.